Opening your own restaurant can be the right move, but many restaurateurs believe operating a franchise can benefit an owner with the experience they need, while also giving them substantial support throughout the learning period. For many, franchising allows ownership of a restaurant without excess investment, time, or risk. Some franchises are more profitable than others, but all share similar characteristics. Some rules between independent ownership and franchising overlap—like location and a good management team—that need to be considered before purchasing a franchise, but overall they are quite different from owning an independent restaurant. 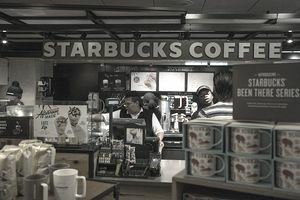 Starbucks is a restaurant chain, but because it is owned by one single parent company, it is not a franchise. You can't purchase a Starbucks coffee shop. Burger King is a chain and a franchise, because you can buy individual units of a Burger King restaurant. So, all franchises are chains, but not all chains are franchises. If you cannot tell which is which, simply call the company headquarters and ask, "Do you offer franchise opportunities?" Most restaurant franchises come with a hefty price tag. Dunkin' Donuts requires prospective franchisees to have a minimum of $1.5 million net worth and $750,000 in cash reserves. Wendy's requires $500,000 in liquid assets and $1 million net worth. Smaller franchises like Pizza Hut require less, but for most people, the amount is still often substantial. Many franchises require previous restaurant or other business-related experience before allowing you to represent their brand. Keep in mind, even if you were to open an independent restaurant, investors may be looking for experience in the restaurant industry as well. Pizza Hut and Taco Bell franchises both require a minimum of three new restaurants within three years, and Dunkin' Donuts requires a minimum investment of five new restaurants at a time. Consider the net worth requirements before proceeding. The investment of time between three restaurants requires serious thought, as even just one franchise can take most of your time. One of the reasons restaurant franchises are so expensive is that they are "turnkey" ready. The kitchen layout, dining room design, menu, and even the marketing campaign are all done for you. You don't have to work at building name recognition because that recognition is part of what you are buying. In many ways, you are purchasing an automated business. Consistency is key when it comes to restaurant franchises. Customers expect the same service, food, and atmosphere no matter where they are. To keep everything consistent across each unit, restaurant franchises come with a thick rulebook outlining the do's and don'ts of franchise ownership. When you agree to purchase a restaurant franchise, you are also agreeing to adhere to all their rules. If you like to cook and create new menu items or plan out aspects of special events, the structured setup of a restaurant franchise may not be creative enough for you. Ditto if you like to set the rules and try new things. You may find that you have to make a hard decision, ultimately deciding if franchising is the right move for you. Even though restaurant franchises are turnkey operations, you should still have a well-thought-out business plan. Run the plan through as many professionals as possible before bringing it before the franchise committee. You can be a single-unit franchise, multi-unit franchise, area developer, or master franchise. What type of franchise you want to own depends largely on your personal wealth. Building a group of like-minded investors offers the opportunity of scaling ownership if you decide to purchase more than a single unit. About 1 percent of the world's population eats at McDonald's on a daily basis. Implementing Henry Ford's assembly line concept, the McDonald brothers began offering the fastest, cheapest food possible by employing low-skilled workers to assemble it. While the brothers were successful at serving food efficiently and inexpensively, they were not so good at franchising. A restaurant equipment salesman by the name of Ray Kroc saw the potential in the McDonald's concept, buying the brothers out in 1954. His formula for franchising set a precedent for fast-food chains, changing the landscape of American dining. When considered with another behemoth of the restaurant franchise game, Subway, these two institutions control two of the most powerful brands in the world.